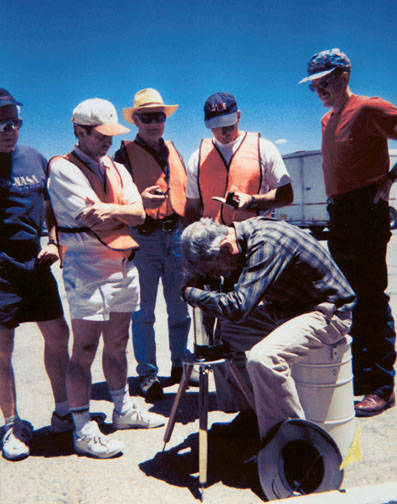 The geophysical exercise is assessed by John Young veteran lunar explorer (with gravimeter), Jim Reilly, geologist astronaut (right), and Duane Ross, astronaut candidate training manager (left). Astronaut candidates Leo Eyharts and Lee Archambault look on, as Bill Muehlberger instructs. The Penguin team 3 was graced by a one-day field visit from several JSC/NASA dignitaries, including John Young (veteran astronaut, lunar field explorer, first shuttle commander), James Reilly (veteran geologist astronaut), and Duane Ross (manager of astronaut candidate training and selection). They observed the geophysical simulation and participated in the data collection. At the end of the last exercise in July, science reporters from the Taos News, Santa Fe New Mexican, and the Albuquerque Journal were invited to "Mars Base" for an opportunity to interview participants. Astronaut Mike Fossum served as spokesperson for the Penguins. Each newspaper published a story on the training program.